Look - Simple yet elegant. The red, white, and yellow come together nicely as a cohesive style. No excessive words or clutter takes up unnecessary space. The script logo and lion emblem age very nice. I really like this can. Smell - Mild malt that isn't overwhelming combined with sweet corn and light, delicate hops. A beautiful bouquet that perfectly encapsulates the spirit of beer. Taste - A fantastic balance of bready and bitter. Right when you think it's gonna tip over into cloying territory, a surprising wave of hops hits you and brings you back. A weird minty touch on the end that reminds me of Red Stripe but better. Refreshing and different for an AAL. Feel - Medium body and creamy carbonation make this an extra smooth easy drinker. Overall - A very high quality beer that justifies its slightly higher price tag than other macros. Surprising on every front, it's near impossible to find anything wrong with this beer. Rated to style; Stroh's hey days are long gone, and that's too bad. Recipe has been tweaked, but still a good brew. Pours a nice touch of gold appearance, head shrinks quick. Surprisingly good lacing in pilsner glass. Tastes a bit sweet with touch of malt and a nice amount of hops to balance the overall taste. Too many reviewers don't give credit to AAL's for being "good" beer and Stroh's is a perfect example of bias. IMO, top 5 for macro AAL's, much tastier than Bud, PBR, MGD, Miller. On par with Coors, Red Stripe, Hamms. Cheers! As a Michigan Native seeing the low rating comes as no surprise. No it's probably not the same recipe used when I would run to cellar for gramps to grab a strohs in the 80s when I was a kid. BUT, It taste like the can advertised to the tee...Great American Lager. Sweet corn lager with a slight hops bite. 5.99 sixer of tall boys. Great Beer for lazy sundays watching the lions lose. Pairs excellent with all appetizers, was awesome with homemade pizza. Pours a great golden clear cornish yellow. Full bodied head dissipates fast. Small tight carbonation bubbles. Smells grassy ,hops ,corn. Taste is pleasant. No off cloying flavors. Smooth. Very easy to drink. Has a the sweetness you expect from a macro but not over the top. I get a slight hop bite after it washes down. Faint peppery sensation. What I like about it the most say vs bud. Buds tend to have to much banana yeast flavor for where its absent in Strohs. Used the drink this back in 1980's. 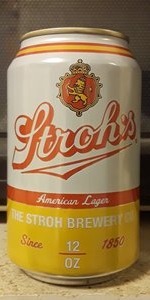 Stroh's was popular in Ohio and had strong sales. Bought some on a whim recently and it's still one of the better macros around and I was surprised how much I enjoyed it. A hint of gold color with good lacing in pilsner glass. A bit sweet, yet balanced smell and an up front malt tinged taste with blend of hops that compliments the sweetness. Transitions to a quick, dry finish. One of the better AAL's on the market. 30 pk cans was $18.99 + tax. Cheers! From a cheap beer drinker, this is way up there. My personal #1 is Hamms. This is #1b. Poured from a cold can into a pilsner glass. Nice yellow color on the pale side. Smell was nice and crisp, a slight hint of yeast. Taste was exactly what I expect in a good cheap beer. Very light, the kind of beer that's perfect for a hot day. The feel was a bit of carbonation but not at all overpowering. Went down so very smooth. Overall, this beer is a close second to my beloved Hamms. Definitely a keeper that will be kept in stock in my fridge. Had this one straight from the bottle at a local watering hole in Corktown. Aroma is sweet: corn, dough, and floral hops. A few pulls from the neck and, blammo! I'm an instant fan. I could chase this clean but sweet bad boy with Stroh's (micro cousin) Bohemian all day. Sweet but not cloying notes of corn, white bread dough, honey biscuit, and a floral finish. This one for me is the king of macro AALs. This is a surprisingly good pale lager! Poured from 12-ounce can into a stemless wine glass. Clear pale yellow in color, with a nice soapy white head that hung around for a few moments before settling to a thin cap leaving some sticky lacing. This is well balanced, light, and easy on the palate. Light malt backbone, with grassy, herbal, and fruity notes. Low bitterness. Finish is mostly clean, with a hint of lingering fruity sweetness. Quite flavorful and refreshing. Pick up some for your next barbecue or beach party. I'm not much on typical American lagers it's by no means a great beer compared to a craft IPA but by no means offensive, I would buy it again as a hot afternoon sipper/lawnmower beer. 2.55? Raul ain’t gonna play Stroh’s like that. Is it that Katherine Hepburn of AAL? Does it walk into the room quoting Shakespeare like said legend in Stage Door? Nah. But what we have here is a perfectly fine, b actor that hits her cues and gets her lines right. It’s all American Adjuncty, ya know, but not metallic and putrid like, well, you know. 16 ounce can into lager glass, best before 5/28/2018. Pours crystal clear medium golden yellow color with a 1 finger dense and rocky white head with great retention, that reduces to a nice cap that lingers. Nice spotty soapy lacing clings on the glass, with a fair amount of streaming carbonation retaining the cap. Fantastic appearance. Aromas of cracker, corn, white bread dough, and lightly toasted biscuit; with lighter notes of honey, nuttiness, pepper, and herbal/grassy earthiness. A touch of fruity aromas, but not overwhelming. Nice and pleasant aromas with pale malt/corn and light earthy hop notes; with solid strength. Taste of cracker, corn, white bread dough, and lightly toasted biscuit; with lighter notes of honey, nuttiness, pepper, and herbal/grassy earthiness. Light herbal, grassy, spicy bitterness on the finish. Lingering notes of cracker, corn, white bread dough, lightly toasted biscuit, light honey/nuttiness, pepper, and herbal/grassy earthiness on the finish for a good bit. Very nice robustness of pale malt/corn and light earthy hop flavors; with great malt/bitterness balance; and zero cloying/astringent flavors after the finish. Fairly crisp/clean finishing. Perfectly clean on lager flavors, with minimal fruity notes present. Light-moderate increasing dryness from lingering bitterness and carbonation. Medium-high carbonation and medium body; with a very smooth, moderately bready/grainy, and lightly sticky mouthfeel that is great. Zero warming alcohol as expected of 4.5%. Overall this is a very good pale adjunct lager! All around nice robustness of pale malt/corn and light earthy hop flavors; very smooth, crisp, clean, and refreshing to drink with the mildly bitter/drying finish. Very flavorful and never watery for the ABV. Very clean and nicely rich malts/grains and solid earthy hop presence for the style. Not overdone on adjuncts, plenty of barley presence. A very enjoyable offering, and spot on style example. One of the absolute best AAL I've ever had for sure.